← Why do I love Luxembourg Park in Paris? We had a day ahead of us with nothing much planned and we were going to Versailles the next day so I wanted to conserve my energy and not walk too much on my feet. 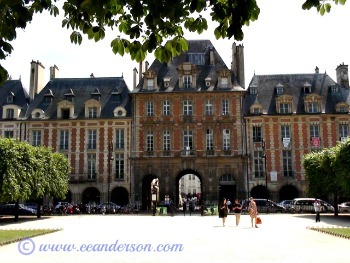 We had heard so much about Place des Vosges the oldest official square in Paris and decided it would be a good day to go there. 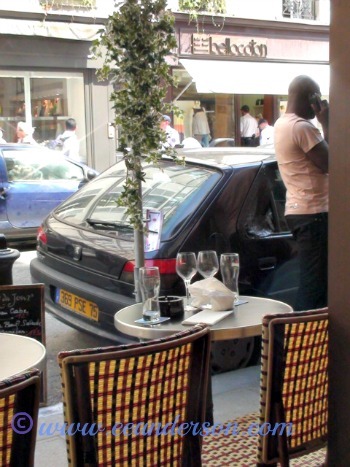 It is located in the Marias…3rd and 4th arrondissement. From where we were in Montparnasse we took the number 6 metro switching to number 1 at Chatelet. The number 1, 5 and 3 all go there and there are lots of metro stops including the Bastille and Saint Paul. You could also take a bus as many lines that have stops nearby. If you take the hop on hop off bus it is the blue line and get off at stop 77. When we got off the metro Bastille we came out at Blvd Beaumarchais then turned left onto victor Hugo and into the park. I entered the plaza with great anticipation, after all this was touted as the best square in the world! Well you can imagine my disappointment. Don’t get me wrong it was a very nice park, trees for shade, benches, grass and statues…everything you would expect. People were enjoying the afternoon reading, picnicking and strolling around. First impressions can be wrong. It was a very sunny day and we got there just before noon so we started to stroll around. Well it didn’t take long for me to become enlightened as to why people liked it so much. It is not because of the park itself but more about the place as a whole. It has a very calming effect on a person. All the red brick and grey buildings are similar and all facing inwards towards the park. There are archways all around on all four streets and these archways lead to a shopper’s paradise especially if you like antiques. The residences are above the shops. 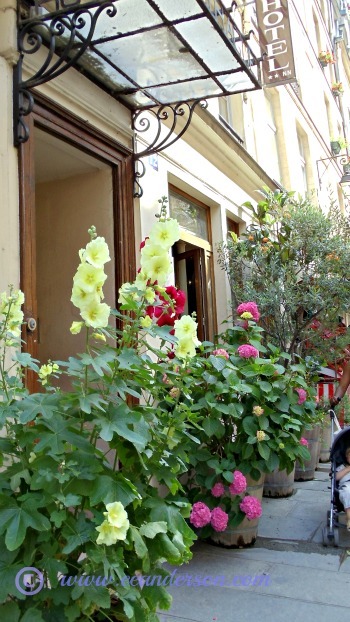 There are lovely little flower shops, bookstores and cafes literally you can go through any archway and discover another fabulous street. There are some very expensive restaurants and shops around the square but go down any side street if you are on a budget like me and you won’t be let down. 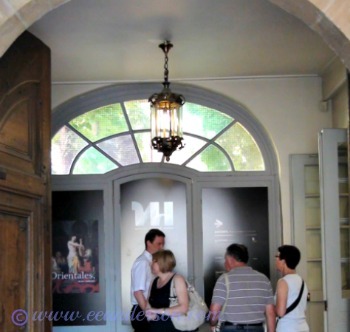 We stopped and had lunch at a good brassiere and people watched for awhile then we went back to visit Victor Hugo’s’ home, the novelist that wrote the hunchback in Notre dame. If you haven’t read the book you probably saw the movie. We noticed the sign when we came into the square. It was his last residence in Paris prior to his exile. The square was originally called Place Royal. He wrote most of his novel, les miserable’s when he lived there. It is a museum in his honor restored to look as it would have when he resided there. What a lovely place to have a home, looking out to the square. It is well worth the visit. It was covered on our museum pass so we did not have to pay an entrance fee and we got pretty little cards for tickets given out at the entrance that I put in my journal. I was so glad that we had taken the time to sit in the park for a time, walk about and look at some of the shops. It really is a pleasant place to spend the day. I know now why so many note this as there favorite square in the world. 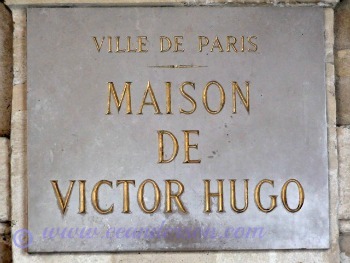 This entry was posted in France, Paris, Travel, Travel tips and tagged Paris, Place de Vosges, Victor Hugo. Bookmark the permalink. 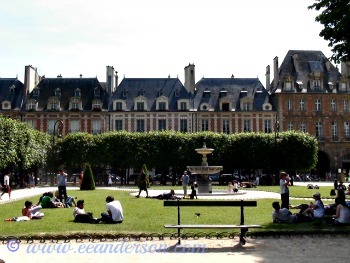 4 Responses to Is Place des Vosges really the nicest square in the world? It may not be the nicest, but it’s certainly up there. 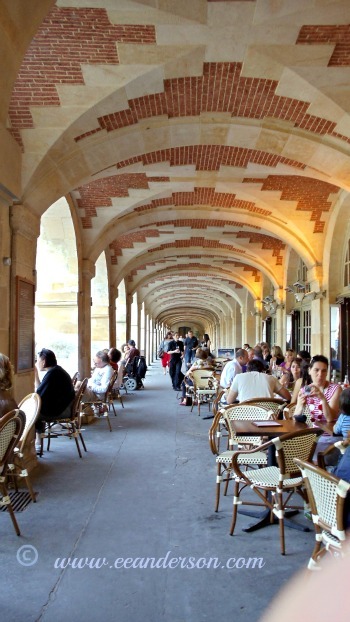 I love Place de Vosges – I love how it is such a local community place. Grandparents, mothers, nounous with their little ones, high school kids having lunch on the grass, all there. Great photos – thanks for posting! It sounds wonderful, with all the different little streets leading off it. I love the arched brickwork in your lunch photo. It is all the little streets that make it so much fun. I am glad that you liked that photo, the brickwork matches on all the buildings .